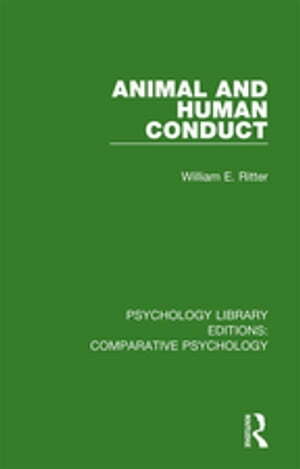 Collins Booksellers - Animal and Human Conduct by William E. Ritter, 9781351257381. Buy this book online. Originally published in 1928, this title looks at the link between animal and human conduct. It had long been recognized on the basis of their activities that many animals possess minds, and that these are similar in a considerable number of respects to human minds. According to the author, this book looks at man’s position within nature from the perspective of a naturalist, rather than a psychologist or philosopher. He has attempted to describe the working of mind and body in human beings and in other living things; to examine critically the mental technique involved in such descriptions; and to reason broadly as to the bearings of the facts and processes on human life. Now it can be read and enjoyed in its historical context.